my pointless: 72 snakes and 3 kids. 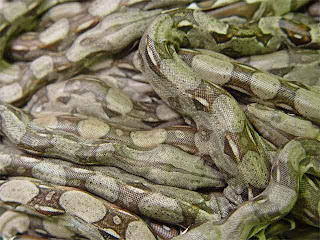 Last week, a team from the Albuquerque, NM Criminal Nuisance Abatement Unit closed a cramped apartment where they found 72 live snakes (mostly boa constrictors). They also found other assorted reptiles and animals. When officials entered the property, they encountered an apartment that was piled high with junk and had a powerful odor from of feces and trash. They also found several dead snakes, which were simply thrown into the bathtub. In addition, they found dead rats and mice which were presumably used as food for the snakes. And oh yes. They also found three children, ages 8, 6 and 2 who were living with their mother. The oldest one no longer could sleep in her bedroom due to snakes, trash and feces. The children (thankfully) have been sent to live with their grandparents. Mom has been charged with several violations, including misdemeanor child abuse.